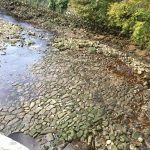 The following is a report by John Mc Carron, Vice Chair of WIH&HS given to the Inish Independent on the recent discovery of an ancient ford at Buncrana’s iconic Castle Bridge. The ford crossing at the Castle Bridge. 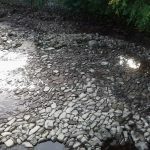 The large paved ford crossing, uncovered recently at the Castle Bridge, by “Oiche Uisce Mór”, the unprecedented flood event on the Crana River, in August, revealed a very exciting discovery. The remaining piece of the paved ford crossing lies on the West side of the mouth of the river Crana, on the seaward side of the bridge. 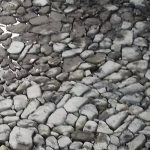 These stones would have been placed by hand, to form a smooth, level road with which to cross the river at low water. It would have been a large undertaking involving lots of manpower and for the builders to invest such an amount of resources shows how important the area was in antiquity. The direction of the paved ford and the way in which the flat stones are arranged suggest the ford ran from O Doherty’s Keep to the area at the bottom of what is now Castle Avenue, where the building known as “The Stone Jug” now stands. This would suggest that the ford crossing pre-dates the bridge which was built by George Vaughan in 1718, placing it in the pre-plantation era. 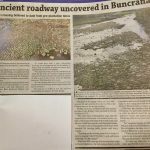 It is an exciting discovery for those of us who are interested in the history and heritage of Buncrana and it’s environs. We know from contemporary maps that the original town of Buncrana was situated on the west bank of the Crana, in the time of the Gaelic lords and the river would have been its most important feature. A sound, safe crossing point would have been essential for moving cattle, horses and heavy wagons. Standing on the crossing point at low water it’s easy to imagine Cahir O’ Doherty’s carts and horses clattering over the stones! When Vaughan moved the town up the hill to its present location, all traces of the original town disappeared. The Crana river has always been an important salmon river. It’s reasonable to assume that trade in salmon has carried on here at this sheltered inlet for many centuries. While not all of the ford crossing remains, it’s a great to see a beautiful piece of construction from the past reveal itself. It is not very often that we get a glimpse into times past but this is just such an occasion. After all the pain and upset caused by the flooding, it’s good to be able to report a positive outcome from the event. West Inishowen History & Heritage Society.